Octoraro Meeting was a branch of West Nottingham Preparative, set up in 1823 to accomodate members who resided north of the Octoraro Creek. 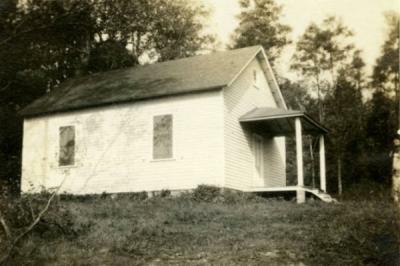 Milton T. Garvin of Lancaster, Pa., responded 5 mo 24, 1933, to a request for information concerning Octoraro Meeting House in the Eighth District of Cecil County, Md., by saying:" I am sorry I have not a copy of the history written by Belle McSharron on the occasion of the dedication of a smaller meeting house, which my uncle and I erected there in 1911. The old, log meeting house, which was built in 1826, had been unused for some years, and was beginning to fall apart, in fact, had about fallen down, and the graveyard was in wretched condition. My grandparents, Thomas and Tabitha Garvin, are buried there, and so we had the place cleaned up and a fence put around. Then we decided it would be possible to put up a chapel there for the use of the neighborhood, of any denomination, or no denomination. This present chapel was dedicated June 9, 1912 and since that time it has been much used for many purposes. A first Day School was conducted fro several years and was largely attended, but that has passed away. THere has been less demand for the chapel during the last four or five years than had existed previously."